Polyethylene Terephthalate (PETE or PET), also known as plastic #1, is one of the most commonly used plastics in the world. Not surprisingly, it’s the most recycled plastic as well – probably all those dreaded water bottles. PET was born in 1973, and was first recycled in 1977 – I can just hear the Bee Gees singing, “More than a plastic; More than a plastic to me”. In 2005, the average U.S. household went through 42 pounds of PET, which seems like a lot. PET is made of polyethylene terephthalate – a durable, strong, lightweight, heat resistant polyester resin. Its density is 1.35-1.38 g/cc, which makes it firm, and its molecular formula is (-CO-C6H5-CO-O-CH2-CH2-O-)n.
PET can be found in water bottles, soda bottles, juice bottles, cooking oil bottles, peanut butter containers, food containers, salad dressing bottles, juice bottles, and even the ubiquitous Starbucks cup. Can it be recycled locally? Yes! Plastics labeled as #1 are accepted by Charleston, Dorchester, and Berkeley County recycling programs. Curbside pickup is typically available, and if not, check our maps for drop site locations. If we can’t reduce our consumption or reuse old bottles, our last green resort is to recycle them. Keeping materials out of the landfill is one of the easiest ways to reduce our footprint, yet so many bottles wind up in the trash. 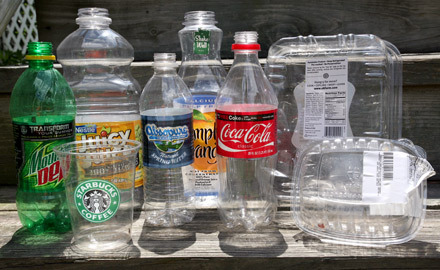 In 2006, the U.S. consumed 60 billion PET beverage bottles but only recycled 10 billion. Consumption is going up, while recycling rates are actually going down – we can do better. Plus, PET can be used to make all kinds of goodies like tote bags, new PET containers for both food and non-food products, fabric, shoes, luggage, carpet, luggage racks, door panels, and more. Check out what the PET industry has to say at The American Plastics Council, NAPCOR, and PET Power, or read the detailed Wikipedia entries about PET and PET recycling. My research turned up this page at Earth Odyssey, which has a wealth of information that is hopefully accurate. And if you’re into more techy stuff, be sure to stop by GoodFellow.com. Amazing, excellent site framework! The time have you ever been blogging regarding? you make blogs start looking effortless. The main appear of this website is excellent, not to this article! surely such as your web-site nevertheless, you must take consumers transliteration upon some of your content. Many of choices filled together with spelling difficulties we still find it really problematic frankly however We’ll surely come once again just as before. Crp0If I think this is a real great blog article.Thanks Again. Want more.